Occasionally, I find myself & the wife in a type of restaurant that repeats itself across the country. These aren't the eateries that entirely play off some combination of fries and fried-meat-patty-on-bun as an excuse for wining & dining; rather, these are the places that have a signature appetizer, followed up by gastric proportions of steak, salad with shrimp, & the like. And it's often the case that the best pour these same chains offer is Sam Adams' Boston Lager. Now, I'm not against Jim Koch's profitable vision. Boston Beer may be the best publicly traded investment out there. And, what's more, I think the Sam Adams glassware is pretty cool. But I'm inclined to recreate my favorite pints, and after a couple Boston Lagers I think I can fill a patented Sam Adams glass with some homebrew that connects the devoted dots. Enter the Kansas City Lager. 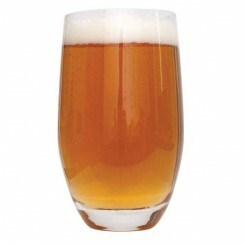 Here's my idea: a recipe with a malt bill & hopping similar to Boston Lager, but with California Lager yeast. Boston versus California ... based on my rail-riding experience, that puts us in about Kansas City! 0.75 oz. Hallertau @ 60"
1 oz. Hallertau @ 15"
Ferment with Y2112, Wyeast California Lager yeast; 2 weeks primary, three weeks in cold keg secondary. The result is a sublime melding of steam beer & continental lager heritage. Crisp finish & earthy yeast undertones partially masked by noble hops in the finish. A true lager fermentation would have brought this brew closer to the inspirational example that I've sipped alongside lobster, steak & the like at the aforementioned restaurants; but t there's nothing holding me back from thawing out some bottom round & microwaving some rehydrated potato flakes to complement my own able brew! reJim, keep up your great brews & ongoing success story. I hope to have a pint of this hybrid doppelganger in hand when I, someday, purchase Boston Beer stock certificates.